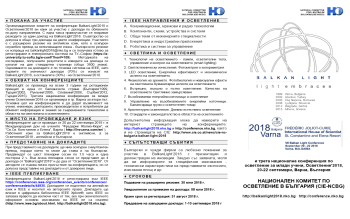 National Committee for Lighting in Bulgaria (NCLBg), Technical University of Sofia, Technical University of Varna, Technical University of Gabrovo and University of Rouse are going to organize the seventh international conference BalkanLight 2018, which will be held in Varna, Bulgaria, on the 20th-22nd of September 2018. On behalf of the Organizing committee, we are pleased to invite you to the seventh Balkan Conference on Lighting – BalkanLight 2018, which will be held from September 20 to 22, 2018 in Varna, Bulgaria. BalkanLight 2018 is organized under the auspices of the National Committee for Lighting in Bulgaria (NCLBg). The NCLBg is an independent non-profit association, which has over 50 years of history. It follows the CIE policy on the science of light and lighting, color and vision, photobiology and other relevant areas. 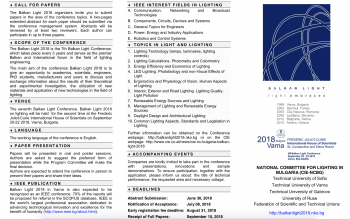 BalkanLight 2018 mainly focuses on providing a scientific forum for all researchers around the world and to enable state of the art knowledge exchange among them as well as leading lighting experts. We look forward to welcoming you in Varna on September 20-22, 2018!